This book contains short and concise exercises for use in a warm-up before practice or performance, and for general technical advancement. The book is divided into four sections: I Arpeggios, II Scales, III Tremolo, and IV Slurs. Each section contains a description of the exercises and general instructions on how to play them. The exercises are intended for guitarists who are looking for a simple warm-up that does not require learning many complicated Etudes, exercises or routines. In this book, only one Etude is used for a variety of arpeggio and tremolo patterns. The scale warm-ups are based on a two-octave, one-position scale that is shifted up and down the fretboard, and a simple one-position chromatic scale. The pull-off and hammer-on slurs are combined into one exercise to save time. This same routine, when practiced with the metronome gradually increasing the tempo, can also double for technical work. With the exception of one chromatic scale exercise, the rest are on closed strings. Besides being able to move the scale up and down the fretboard, the first finger can be barred. This will increase the left hand difficulty and improve the left hand position and strength.There is close to an hour's worth of material if all the exercises are played with all of their variations at different tempos. Not everything needs to be played everyday, so the warm-up session can be as long as desired or as short as time allows. 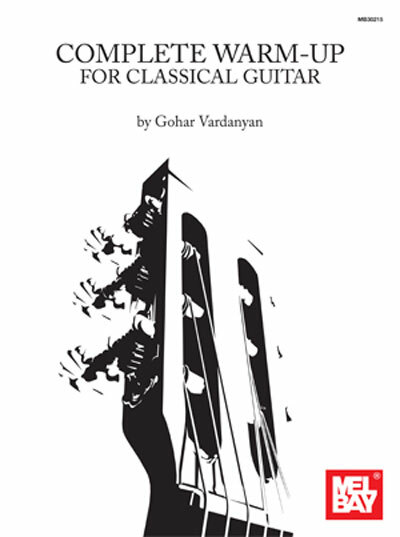 Gohar Vardanyan has put together a great book, here, with exercises in arpeggios, scales, tremolo, and slurs. Several are based on Giuliani's Etude No. 5, which she plays beautifully in a Strings by Mail Lessonette. I'm interested in this book but I don´t dominate the music language. Are the exercise accompanied with tabs? A: No, sorry standard notation only.